Hedgewitch(Joy Ann Jones) here, manning, womanning or spiriting the pub tonight, whichever you prefer, and hollering a large ¡Hola! to connoisseurs of the word, pub patrons, passersby and poetic bon vivants. Welcome all to the forty-eighth Open Link Night at dVerse Poets Pub. Here we take our name seriously, especially on Open Link Night. It’s then we want the whole neighborhood to walk in the Open door, Link a poem of their choice on any topic, of any vintage, pull up a stool, talk all Night, share a few laughs, and enjoy the truly dVerse offerings of all sorts of Poets writing on tap at the Pub for our mutual enjoyment. Many of the recent posts here have been about encouraging community, as that is one of the pub’s primary missions in the online wilderness, where so many talents wander in search of expression. This one is no different, and I’m going to share my own take on the importance of connection tonight by looking very briefly at the life and work of a favorite poet of mine, Emily Dickinson. I identify most strongly with Dickinson for several reasons; her voice as a female poet, her love of nature and the garden which she incorporated into so many of her poems, her many losses and disappointments in love and life, but perhaps foremost her reclusiveness. We’ve all heard of historic examples of poetic salons and artistic communities such as that of the Lost Generation in 1920’s Paris, where literary giants like Hemingway, Fitzgerald and Pound mingled socially with artists and fellow creators of every stripe. In contrast, Emily Dickinson lived most of her life in extreme isolation. For much of it, particularly the latter part, she never left her own home, or saw anyone outside her own family circle. Yet Dickinson enjoyed a lifelong, extremely important series of literary and personal correspondences, leaving over a thousand letters extant at her death. Along with advice, opinion and support, she often included poetry and pressed flowers in her letters, and there’s no doubt that many of the connections she made influenced and sustained her voluminous writing production of over eight hundred poems over the course of her life. Before we get down to just that, I’ll leave you with two short poems on writing from Dickinson herself, and a few links for those who may want to know more about one of the seminal transitional figures in American poetry. The Poetry Foundation has a lengthy detailed and insightful biography of her here. The Emily Dickinson Museum has an overview of her correspondence here and a voluminous list of her many correspondents can be found at the Emily Dickinson.org wiki. Alright, now let’s enjoy some of that support and community I’ve been talking about, and remember, however wildly social or reclusive you might be, here you’re among kindred spirits. Link in the poem you’d like to share (1 per blog, please) by clicking on the Mr.Linky button just below. Visit as many other poems as you like, commenting as you see fit. Remember that this is how we connect with those who can support and encourage us, and for whom we provide the same vital benefits. Finally, enjoy! Remember, we are here for each other. Engage your fellow poets, talk, chat, comment, let them know their work is being read, and enjoy the input you also will receive. This is all about community. Graduate of Satan's Reform School for Wayward Girls. Doctorate in Advanced Verbosity from STFU. Gainfully unemployed landscaping the muse factory. Oh Joy Ann, I just love Emily Dickinson, and I love this community. If only she had had this kind of support when she was writing, I imagine she’d have churned out several more books of poetry. Thanks for hosting, and to all the poets, enjoy yourselves – I’m looking forward to visiting your blogs! You’re welcome Heather. And yes, I think Emily would have taken to the internet well. Thanks for joining us tonight. Thanks for the poems by Emily, today, and for hosting at the bar. I always enjoy your presentations. Loved your poem, too, by the way. I know it will be a rousing set of reads here at the pub tonight and I’m looking forward to making the rounds. Heading out now. Talk to you a little later. Welcome all! Thank you Gay. See you on the trail. Pour me a large single malt, on ice: I am here for the duration. I adore OpenLinkNight. Happy reading everyone. Coming right up.Good to see you here. Welcome all, newbies and old hands alike. Looking forward to a night of reading, sharing and enjoying some of the best poetry on the web, so bring it on! Emily is unknown territory for me and this is a nice way of meetifng her. Thank you for making me realize how approachable she is. Most welcome. She’s very different from most poets of her time, much closer to modern styles, imo. Been on a long pilgrimage. Glad to finally wander back to the pub. The Old Monk is always welcome here. I’ve been rollin’ out some fairly heavy stuff of late, so thought I’d lighten up a bit this week. Here’s one about Mom’s cookin’ back in the day. She’s gotten WAY better, but there’s stories to tell. Wait til you hear the one bout the fudge! Should I wait till after dinner–I’m starved right now. My mother couldn’t boil water. Proud to be a part of this community and salon, Hedge. Thank you for the wonderful intro. Cheers! Thanks, Jackie–good to see you! Looking forward to reading everyone’s work, and discussing. This is my first time here… so what’s on tap? I like dark! We usually have plenty of that–and I almost always have it in my cauldron back at the Castle. Whew… I am sooo ready for a poetry break! Love Emily Dickinson, and funny, because I have spent much time thinking lately about how much of a hermit I am, and trying to decided if that’s a good thing or a bad thing. You have made me lean back towards it being a good thing. Thank you. Yay for Poetry! Thanks, Kelly. I personally embrace my curmudgeonly reclusiveness. But I am *extremely* glad there is an internet. Hey folks, sorry I’m a bit late, domestic duties were calling! Aaah, here now though. Thanks for the lovely intro tonight and for sharing your experiences of Emily Dickinson, great! Make mine a pint of something cold with a dash of poetry and a slice of rhyme! Yes, thanks for hosting tonight’s ‘do’ at my fav pub. Lovely prose by Emily Dickinson, I’m sure most of the old poets/writers/dreamers would love the internet too. Eight hundred poems, lots of pencils there. I have found I can write one in my head, get up and thirty minutes later it’s gone. I’m a hermit with a taxi license. Ha! There are pads everywhere in my house–even on the riding mower–but the shower is where I lose them. Hedge…I had to take a moment to recuperate from your post. I am so alone when it comes to real world bodies in my passions and the things I like to do. I love that Emily was the same, and have clung to her bio for some sense of proof that I’m okay…(that doubt is a wicked shadow) So yes…this community sustains me…I have learned, I have grown, and consider it a hearty rung on my personal evolutionary ladder. Thank you for this post…I will now compose myself and lose the path in some of the fantastic poetry compliments of these dVerse wordbenders! I know what you mean, Tash–in her later life Emily stood behind doors to talk to people, and wouldn’t leave her father’s house. I hope never to get quite that reclusive, but somedays, I do feel like it. Still, this community is a great way to connect with people who actually have a clue about what kind of people we are and why we’re all here. And you certainly prove every day how real all those connections we make are. I left him mints. What dreadful breath! 2) Fame is a fickle food. My stomach hurts cuz I’ve been booed. You slay me, Mad. I wonder if Emily ever wrote a limerick? She did love the short form. Oh God! I’m laughing still….I think you should have won! That second one really gave me a belly laugh. Sigh….Hedge, your post here was very moving, and relevant. I think many of us feel bound in isolation, and proclaiming ourselves as poets can increase the stares…and the missed connections. Sometimes we can dash off our poetry…it comes from a surge in the blood, but so many times our poems are pulled out of us by ourselves in pieces…and look like a jamble before us. I have wanted to study more of Dickerson, and yet I haven’t. I think she has something to say to us, and to us especially as women poets. So, thank you, Hedge, for turning our eyes to her. I got nuthin’ new, so I’m posting something of last year I think: “Poem of the Night”. I’ll make the rounds this week….I desperately need inspiration. Your words always connect for me Jane–old or new. So glad you’re sharing with us. Scholars say she wrote in the ballad form a lot, but still some of Dickinson’s poems really remind me of haiku and tanka, westernized–you might enjoy them. Very few of her works are more than ten or fifteen lines, many less than five. Well, you have given me some ‘lift under my wings’ and since she writes short…..I can really relate to that. Thank you, Hedge, again…for renewing inspiration. I was getting….numb. 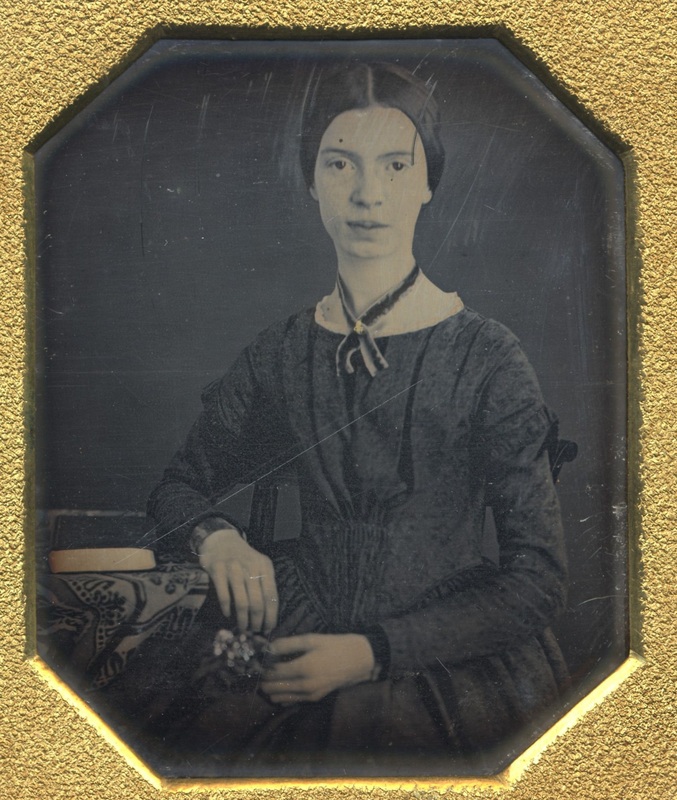 Joy Ann, Emily Dickinson is my ALL TIME FAVORIte POET. I find no one else captures a picture of God better, His creation, His care….and her own experiences with Him. Glad you enjoyed, and hope you feel better soon, Jody. What in the Dickinson?! Sorry – actually I’m not – in a silly mood. It reflects in my entry. Enjoy! Thanks for sharing with us all. I’m linking in an older post, that every time I read it back…I re-love it. It’s one of my most special babies. finaly got on – thought I’d leave a post! It’s been such a long year surrounded by loss – I’m looking forward to reading some poetry! I love the write up and the sense of community I only find online at dVerse. I’ve selected an out of character write for me (no need to bring a dictionary) complete with puppy pictures. They’re bundles of joy, named Sophie and Celeste and I wanted to introduce them around the pub without anyone worrying about potty training. They send licks and tail wags! Nothing like puppies to break the ice at a party, Anna. I loved their pics on facebook. So true, they’ve been stopping traffic all week :). Make mine a large Sauvignon Blanc – not everyone’s fave, but I like it! I have to take a short break to get some veggies in the stew pot, but I’ll be back–enjoyed enormously what I’ve read so far. Wow! It’s only 4:05, and already 82 people have visited! 5 came in the door with me. I look forward to this open link night. I’ll hang out a bit, then go to a HS graduation, and then be back. Right now rain is falling gently in the Philadelphia, PA area, and my windows open to the swishes of cars going only 20mph. Slowmo, almost. sh sh shhhhshhhhhhshh shh . . . So glad you invited Emily to join us at the pub this evening, JoyAnn. A recluse after my own heart! And we sometimes need one. Loved your poem tonight, Louise. Thanks Poppy. Always good to see you here. Wonder why my link always goes back to the previous post: I carefuylly remove them from my history before I arrive here, but still, I can’t get the right one. Haven’t got that far yet, but I’ll be there soon–you do have to backspace or delete the box completely before entering the new post url–it will have your last link in it automatically. Thanks so much for the opportunity to post a link to my blog here. Kolembo http://kolembo.wordpress.com invited me to do so… he enjoys it here very much and thought I would as well! I look forward to exploring and work of other poets and sharing some of mine. Welcome Lesley-Anne. Glad you could join us. Looking forward to spending the next few days reading some wonderful stuff here. Yes, it takes me days, too. Good to see you Becky. Dear Emily! I love her too, and have done so a long time. I’ll have fun exploring those links and getting to know her even better. The biography link is almost booklength. I’ve read much about her, but this had a lot of new stuff. Glad you could join us, Rosemary. Just read your post re community and my heart said… yes… now we’re talking! It is an isolated and isolating life, writing, and so I look forward to what this place may become as I have just walked through the door today. Here’s a great article my non-poet husband pointed out to me yesterday, and it may bring a smile to your face as it did to mine. We’re all so different, yet so similar. Humans, I mean. Looks very interesting–it would be quite a thrill to win a prize like that! I can’t even imagine it. I’ve bookmarked the site to read it all later–thanks and welcome to the pub. This is a lovely post. You have done Emily Dickinson justice. Nice to see so many people here tonight. Lovely words in this post about community (and of course the wonderful Emily). It seems we all bring different things to the pub… and tonight my link brings a cardigan… 😉 Very happy to be here. Joy, thank you for your eloquence as well as the poetry you continually share with us. I believe that if she were living now, Dickinson would be doing just as you are. And here’s something to think about: Dickinson has the reputation of someone who hid away from the world, yet when you count up the number of people she corresponded with and sent poems to, she had more “followers” than many of us (more than me, anyway), and that’s without all of the advantages of the internet. Thanks, Mark. Yes I was amazed at the length of the list of her correspondents, many of them life long. I think she expressed it well in ‘The soul seeks its own society..’ That we need to find affinities and inspirations, and not waste our limited time and resources on things or people that will never sustain us. Hi Joy! Unfortunately, no one has filled in my boss on the importance of this community to me! He seems to think I should be working Tuesday afternoons and into the eve! I do hope to finish something and visit around before the bell tolls. Thanks for the Dickinson and the wise words. You know, I’ve been thinking lately about these issues because there is a lot of discussion in the news about whether connections on social media are superficial. I think it’s a bit different though if you are simply sharing “news” or moods, etc. and sharing creative work. There is something so inherently intimate in poetry, especially when shared with others engaged in the same enterprise/effort. It is a different kind of connection I think and sure, sometimes, it can be superficial, but other times, it can absolutely transcend that. k.
Yes, I’ve heard that ‘superficial’ argument a lot, and I agree much online discourse is unimportant and transitory–but then, so is much non-online discourse. ;_) I do think creative work is a different sort of animal, since it is so difficult to share the ups and downs of the process, let alone the results, in a meaningful way with people who have no clue or interest. And we must certainly have a chat with your boss and convince him you will be more productive if you’re allowed some Tuesday R&R at the pub.Therapy session? i love emily but posted about whit… what does that say about me ? 🙂 excited, on this rainy evening, to settle in for some poetry! I hope the Pub has a TV. One thing I took from Denver was a love for American Basketball, I know I am in the minority, but it is something I enjoy. But not as much as reading good poetry, which I will be doing too, with a brandy or two. I could not decide on a melody for my entry so I used them all and could not settle on a title, so I just called it blue. No deep meaning there, or music reference. I just used the word a lot :). Hope to enjoy a good night of reading. Cheers. Glad you made it Chris. Glass of house red wine coming up, and don’t mind if I join you. Nice choice of poems and great thoughts on community. This is one of my favorite spots to get to know my neighbors. My biggest contribution to this community is really in my reading of all the fine writing that goes on here. Wish I could buy everyone a drink. hush you…your poetry is lovely myrna….i think you contribute much….smiles. i think though that the contribution of reading is a beautiful thing too, and encouraging…. heading off line for a bit to love on the fam…be back later tonight to catch up…peace poets…. I agree with Brian–reading is every bit as important to the community, but I like to see you post your poetry as well. Thanks for being one of our pub patrons tonight, Myrna. I too enjoy Emily Dickinson’s writing, and thought your did an amazing job acknowledging her work and bringing the present day connection into context. I really enjoyed the piece by Emily Dickinson and glad to be part of this community. Taking a break for this evening, all, but I’ll be back tomorrow to read on–just some great stuff out there tonight. Thanks to everyone for sharing with us. Sorry to be running in late. Working next two weeks until 7:00 pm every day, so will be late next week, too. Loved your intro, Joy. Emily Dickinson is a perennial favorite here in our neck of the woods. She lived in Amherst, MA, a mere 17 miles north from where I do now, and went to school at Mt. Holyoke College, then Mt. Holyoke Girl’s Seminary, in the quaint small town of South Hadley, MA. She and Robert Frost, another New Englander, are my two favorites! Thank you for sharing her here tonight. thanks, joy, for the great shout out for Emily D. – one of my favs. Happy OLN, everyone! Meant to be here earlier, but then my son swung on a rope swing … right into a big wooden post. Ouch! welcome home claudia…hope work is gracious today and not too hard on you…. Thanks Claudia–my day swarmed on me yesterday–glad to know you’re back safely. haha! Having so much fun! I’ve read some scorchers! And a beautiful tribute to a father.